Dome Cap Cable Glands provide easy handling, quick installation, impact & abrasion resistance even at very low temperatures. These connectors are designed to withstand the rigors of continuous flexing & bending with ease and can be used with a wide range of cables both indoors & outdoors. UL & CSA Approved and exceeding NEMA 6 specifications, Dome Cap Cable Glands are also IP 68 rated making them suitable for use underwater to 130 feet. Standard nylon connectors in a wide range of sizes with either NPT or Pg threads. A Spiral-Flex extended version for a greater level of strain relief, preventing sharp bends or kinks, and for additional damage protection from moving machinery or machine parts. 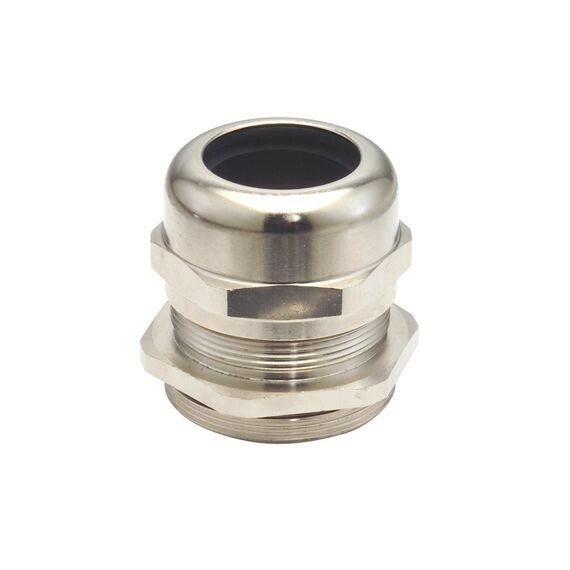 A variety of nickel-plated brass connectors in NPT, ISO/Metric and Pg threads that are ideal for use in a wide variety of applications including corrosive and industrial environments. EN 50262-compliant EMC cable glands equipped with 6 internal ‘fingers’ that clamp onto the cable shielding to provide 360° electromagnetic interference. Available with ISO/Metric or NPT threads. Ventilation Plugs that reduce the adverse affects of humidity in the environment by preventing pressure increase inside the enclosure & limiting temperature increase through air circulation. Vent plugs are permeable to gases and vapors but impermeable to liquids and dust. Accessories including O-Rings, Locknuts and Blind Stop Plugs.